Is the Sustainable Ratings EcoSystem Healthy? We learned recently that Newsweek may stop issuing its annual “Greenrankings” list. Its ordinal ranking of the top 500 US companies and its companion list of 500 world companies had become a highly anticipated annual event. Are we losing diversity? Will we know less about corporate sustainability as a result? CSRHub has gathered sustainability ratings over the past six years from more than 290 different sources. 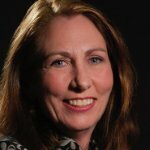 This unique dataset should allow us to measure how much diversity there is between ratings of corporate social responsibility performance. Our database should also allow us to examine whether or not ratings are starting to converge. The distributions of our ratings for 2009 and 2011 were pretty similar. It is only in 2012 and 2013 that our ratings started to “focus” around their midpoint. 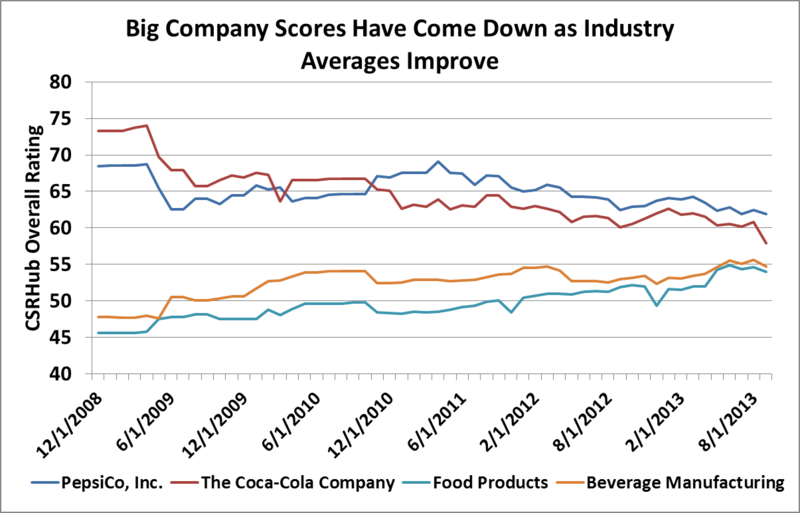 Clearly, the spread among sustainability ratings of the 8,500 companies we track is narrowing. 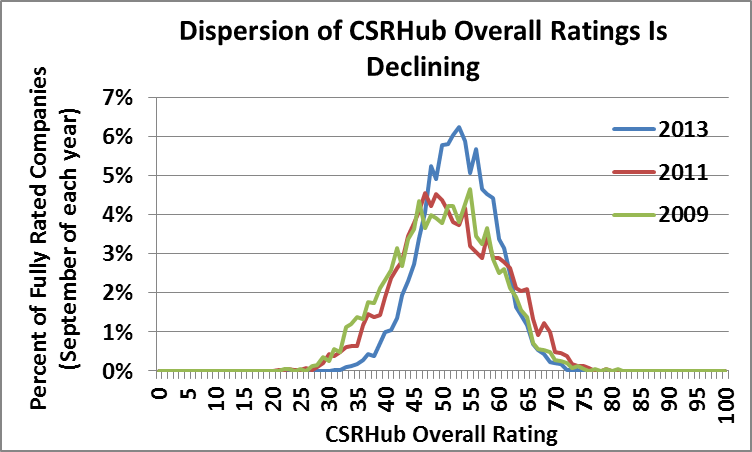 Yet there has been no change in CSRHub’s rating system that would cause our ratings to compress. What about our sources? Has the reduction in diversity of sources led to ratings compression? While our analyses show a slight increase in correlation between raters, it is not enough to explain the reduction in ratings diversity—especially since our data covers a much broader set of companies and many more small companies than in our individual ratings sources. What other explanation could make sense? 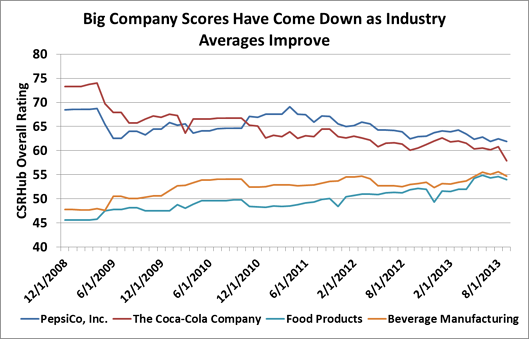 We believe that this ratings compression is due not to a loss of ratings diversity but to the fact that smaller and mid-sized companies may have begun integrating the sustainability advances that bigger companies pioneered. As the average performance of the companies in an industry improves, it becomes harder for sustainability leaders to maintain a lead over their peers. As a result, though the absolute performance of an industry leader may remain high or even improve, its relative performance may appear to fall. These performance ratings are based on 290 sources and included Newsweek. Did Newsweek have any “special sauce” that we may miss after it is gone? 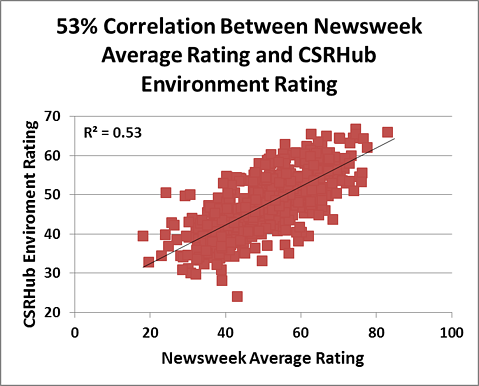 The correlation between the last Newsweek ratings (their 2012 scores) and the same vintage ratings from CSRHub is 53%--an extremely high number. The Newsweek data set covered only 500 US companies and another 338 non-US companies (162 of the companies on the Newsweek Global list were US companies). This is only about 10% of the universe that CSRHub covers. The Newsweek data set was updated only once per year—many of CSRHub’s sources update their ratings monthly. And, Newsweek generated only four ratings elements per company—other CSRHub sources generate more than 100 elements per company. Losing Newsweek should not affect CSRHub’s ratings and probably will not affect how the 800+ companies who were on its list are seen by other ratings sources. The disappearance of Newsweek leaves CSRHub as the broadest (only?) remaining publicly-available measure of corporate environmental performance. We don’t feel its passing will make much difference in our knowledge about corporate responsibility.